Running one marathon is hard enough but some people just have to make the rest of us look lazy. 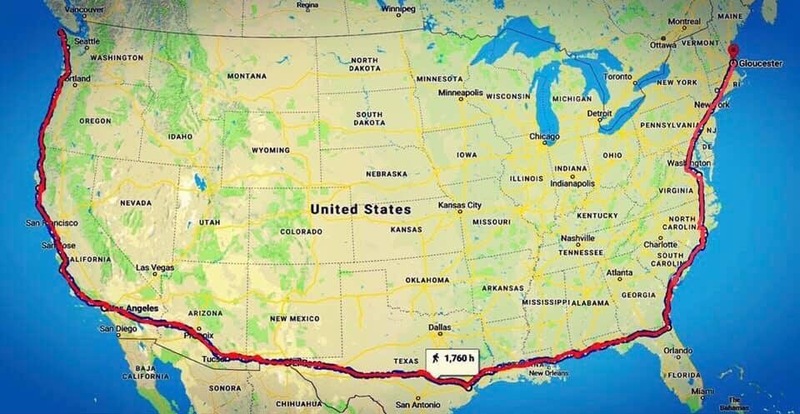 On Thursday, 28 March 2019, Jamie McDonald aka Adventureman completed his solo 5,500 mile, 210 marathon, coast-to-coast fundraising run across the United States in Gloucester, Massachusetts - after a year on the road, raising nearly $200,000 for sick children. 32-year-old Jamie McDonald, from Gloucester, England, aka 'Adventureman' spent the first nine years of his life in and out of hospital with a rare spinal condition; syringomyelia. Combined with a very weak immune system and epilepsy, Jamie’s health was very poor – his family feared he might lose his mobility altogether. At nine years old, and against the odds, his symptoms eased, allowing Jamie to slowly become more active. Jamie began his coast-to-coast marathon - and without a support crew - at Cape Alava in Washington, the westernmost point of the United States. He ran every mile dressed as his superhero alter-ego, adventure. The customer was specially made by 10 year old supporter, Conner Reddy. Jamie ran through twenty one states, visiting twelve children's hospitals en route. According to Jamie, “My body is in pieces. I can feel the aches of every single one of those steps - but I wouldn’t change it for the world, and could not be more thankful for the support I’ve had and continue to receive. People from all over the world joined the incredible people of Gloucester, Massachusetts to celebrate the finish of the run and to be honest, I’ve been quite emotional since dipping my hand in the Atlantic, a year on from doing the same thing in the Pacific. As if this 5,500 mile, coast-to coast marathon, Jamie is now heading back home to Gloucester where he plans beat the world record for ‘the greatest distance covered on a treadmill within one week’, starting on April 29th. The record currently stands at 513.97 miles. Jamie also completed a coast-to-coast run across Canada in 2014, spawning a #1 best-selling travel book and raising more than $500,000.